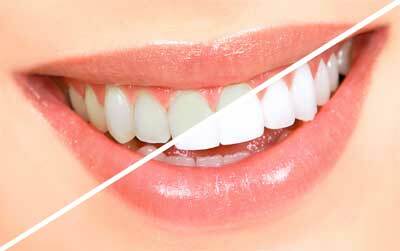 Tooth whitening is a cosmetic dentistry procedure that lightens teeth and helps to remove stains and discoloration. It is the most popular treatment by both men and women alike and the treatments available range from one-hour one-time dental visits to take-home do-it-yourself kits. Tooth whitening is popular because it can significantly improve the appearance of your teeth at much less cost and inconvenience than other techniques. Yellow or stained teeth are a common problem most Americans will develop at some point in their lives but can remedy with proper treatment. Our teeth contain enamel, a porcelain-like surface that started out sparkling white. Tooth enamel is designed to protect the teeth from the effects of chewing, gnashing, trauma and acid attacks caused by sugar. Over time, our enamel starts to hold stains within its pores and becomes more transparent and permits the yellow color of dentin, the tooth’s core material, to show through. As more stains and debris accumulate because of normal wear and tear and eating habits, the teeth develop a dull, lackluster appearance. Tooth whitening exists to remove the stains and debris associated with diet and aging. Today there are many options for teeth whitening. 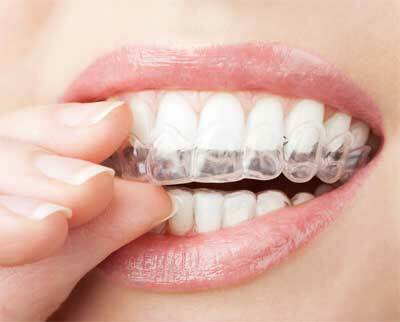 Two of the best options are in-office whitening and fabrication of custom trays for at-home whitening. In-office whitening is done with a simple procedure in about one hour.